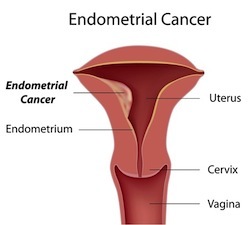 Young women diagnosed with endometrial cancer may think pregnancy is out of the question, but researchers at the University of Ulsan College of Medicine in Seoul, Korea report otherwise in a study published in the European Journal of Cancer. The study involved 148 patients, all younger than 40 years. The patients were diagnosed with stage 1A endometrial cancer. Patients were treated with megestrol acetate (MA) or medroxyprogesterone acetate (MPA) daily. Complete response to treatment was noted in 115 patients, which preserved fertility and allowed women to choose pregnancy. Thirty-five patients experienced cancer recurrence within 66 months of treatment, but 66% of women were cancer-free at the five-year mark. Patients who did not achieve a complete response to the progesterone treatment were later treated surgically with no cancer recurrence after 41 months. None of the patients in the study progressed beyond stage 1A. BMI was noted as a major factor in recurrence risk. Recurrence occurred less often in patients treated with MPA and those who achieved pregnancy. Conclusion: Progesterone treatment for stage 1A endometrial cancer can be safe and effective for women who want to protect fertility. Source: Park JY, Kim DY, Kim JH, Kim YM, Kim KR, Kim YT, Seong SJ, Kim TJ, Kim JW, Kim SM, Bae DS, Nam JH. Long-term oncologic outcomes after fertility-sparing management using oral progestin for young women with endometrial cancer (KGOG 2002). Eur J Cancer. 2012 Oct 13. pii: S0959-8049(12)00731-9. doi: 10.1016/j.ejca.2012.09.017.